There are billions of free recipes available online, literally at the tips of our fingers, whenever and wherever we want. And that is simply extraordinary. But it is also incredibly overwhelming. How do you know if you can trust an online recipe? How do you know if it's actually been tested? If it will actually be as good as it claims? Well, obviously, start by using trusted websites (Smitten Kitchen is my all-time favourite because she really tests her recipes before posting them). And when you use larger sites like Epicuious, Food.com, or Allrecipes, take the time to read some of the readers comments; they can be so helpful. And finally, be weary of huge mega-sites that mass-produce recipes just for the sake of turning out new content 5 times a day. It's quality not quantity. 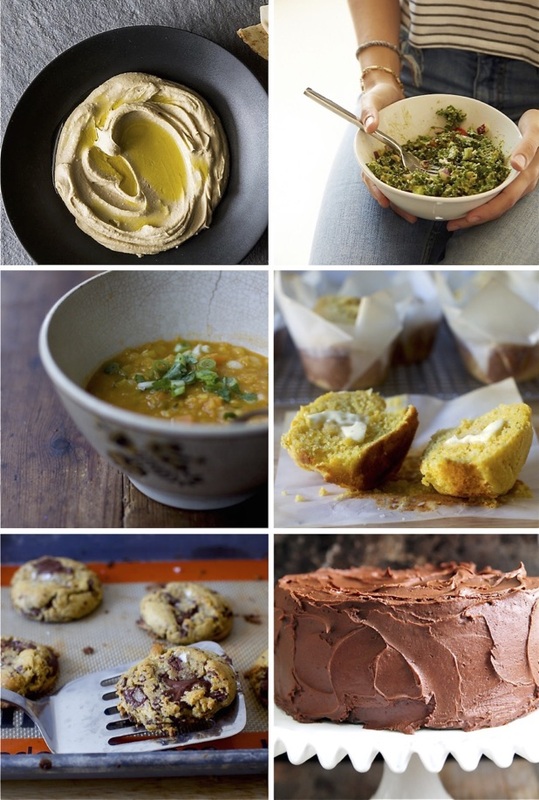 Anyway, I thought it would be fun to share a few of my favourite go-to recipes from around the web. The ones I keep going back to and making over and over again because they are so good, or so easy and so good. Perfect Cornmeal Muffins from Smitten Kitchen - these are just outrageously good. I've probably made them 10-12 times already. I'll never look for another cornbread recipe again. Avocado Kale Salad from Design for Mankind. This incredibly healthy kale salad is made utterly delicious by massaging chopped avocado and mustard into raw kale leaves.... which completely transforms them. The trick is to chop the kale really small and make sure to remove all the thick stems and veins first. Ottolenghi's basic Hummus - you can buy great hummus everywhere, but if you're going to make your own, this is the one to make. Surprisingly, it doesn't contain any oil at all, and it is still the creamiest hummus out there. Dijon Rosemary Glazed Racks of Lamb - I don't cook a lot of meat, but this is one of the dishes I do cook on the rare occasion, and it is amazing. Jim Lahey's No-Knead Bread - the original recipe that propelled me (and much of the world) into a frenzy of bread-making, that persists to this day. The Best Chocolate Cake by Add a Pinch (whenever I need to bake a birthday cake for someone), equally rivalled by Pioneer Woman's Chocolate Sheet Cake (for when I need to feed a crowd). Salted Chocolate Chunk Cookies - there are a lot of cookie recipes out there claiming to be the best. Rest assured, these ones are the ones! Make the dough, form them into balls and then freeze them. Store the unbaked balls in a ziplock bag in your freezer and bake a few up fresh - straight from the freezer - whenever you have company (or for yourself) for the most amazing dessert ever! That hummus looks so good! And I tried those salted chocolate chunk cookies when you blogged about them and they were a hit with all my nursing buddies when I took them to work! Pinterest is my go to! I have so many food pins and not enough time to try them all. * darn autocorrect on my phone! I meant to say, "going to follow your PINTERST board too"
Thanks for following my phone bye rest board! Nice and informative blog, like rhis info, keep posting. Yummie recipies.. like to try it..